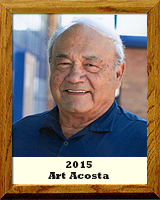 Art Acosta played football, baseball and ran track, lettering in all three sports for Tucson High School. He was on the varsity football team as a freshman but moved to the freshman team for more playing experience. In his sophomore year Acosta was the starting tailback on the varsity team. In 1956, Acosta rushed for over 1000 yards and scored eleven rushing touchdowns. In that same year, he scored all 21 points against undefeated West Phoenix High. He did the same thing against undefeated and favored Mesa High School. In addition to being selected to the All-State team, he was also selected to the “Teen Magazine” All America team. Acosta received 7 certificates of merit for outstanding performances from sports editor George McLeod. Acosta played in Flagstaff in the North-South game. He scored a touchdown and intercepted a pass to help the South win the game. He was All-City three years in baseball and All-State two years in football. While at Michigan State on a football scholarship, Acosta suffered a career ending injury. He came back to Tucson High School and taught Biology and coached football and baseball. He was an assistant coach on numerous State Championship teams. Acosta also coached at Pueblo, Sabino and Rincon/University High Schools as head coach in baseball, football and softball, qualifying several teams for state tournaments. Acosta has taught students how to drive cars for fifty years from 1964 to the present. He was selected to the Tucson High School Hall of Fame in 2004. He has been married to Jeannette for 54 years, has 4 children, 12 grandchildren and 2 great grandchildren.